What is an atomised conformal coating spray valve and how does it affect my selective robot process? Atomised spray valves rely on mixing the material with air, to break it into small, discrete particles and shape the resulting spray pattern to form a well defined pattern. What conformal coating application techniques do the Diamond Group se in their conformal coating service? Diamond SCH, Diamond MT and SCH use all of the conformal coating techniques including parylene, dipping, spraying, brushing, selective robotic application, conformal coating removal & stripping, cleaning and ionic cleanliness testing. For further information click on Conformal Coating Service Information. 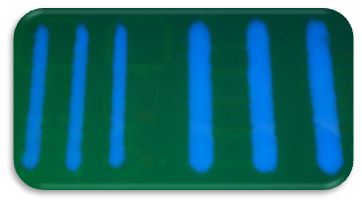 What conformal coating application techniques do SCH use in their conformal coating service? SCH use all of the conformal coating techniques including dipping, spraying, brushing, selective robotic application, conformal coating removal & stripping, cleaning and ionic cleanliness testing. SCH offer quality conformal coating training both on and off site. SCH have a dedicated training room for conformal coating courses and demonstrations of conformal coating equipment. Using this facility candidates get complete hands-on experience with the conformal coating systems and processes without disturbance to production with a full range of systems available to ensure the best learning environment. Conformal coating systems in the training facility include UV conformal coating curing, conformal coating dip, conformal coating spraying, manual conformal coating inspection and the new ACCIS Automated Conformal Coating Inspection System. Further, processes such as viscosity measurement, masking, de-masking, coating thickness measurement and solvent exposure monitoring can all be undertaken to give the maximum experience to the candidate. Whether you plan to install a conformal coating process or currently use conformal coatings such as Humiseal we can help to develop or optimise your conformal coating process, to ensure you achieve the best performance. SCH can offer expert training in all areas of conformal coating including conformal coating application techniques, conformal coating material selection, optimisation, conformal coating health & safety and trouble shooting conformal coating problems. Click here for conformal coating training page. SCH have a full network of distributors to support their conformal coating equipment. SCH have ex-demo and reconditioned conformal coating equipment including a PVA spray conformal coating robot, conformal coating spray booth, conformal coating drying cabinet and a UV curing conveyor for cure of UV conformal coatings and other UV cure materials.